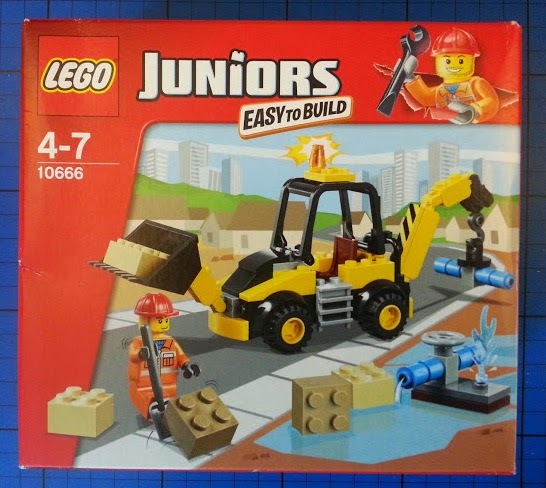 If you haven't come across it before, then for younger builders who are new to LEGO, there is a range designed especially for them, and it's called LEGO Juniors. I'm a fan of LEGO Juniors. I think it makes a great bridge between DUPLO and little LEGO. The components are all straightforward little standard LEGO pieces, and they are part of the other ranges, such as Knights, Princess, Batman and City, but if you were making a vehicle then you'd find a chassis piece to start you off, and instead of having to make a complex or large part, it will already be in one piece - as LEGO say 'Easy to Build'. The builds are clear from the start, with the main part taking shape more quickly, so the builder doesn't become confused about where they are. There are no tricky building techniques or tiny bricks fixed to other tiny bricks, which little fingers aren't strong enough to pull apart. The instructions are larger and very simple. 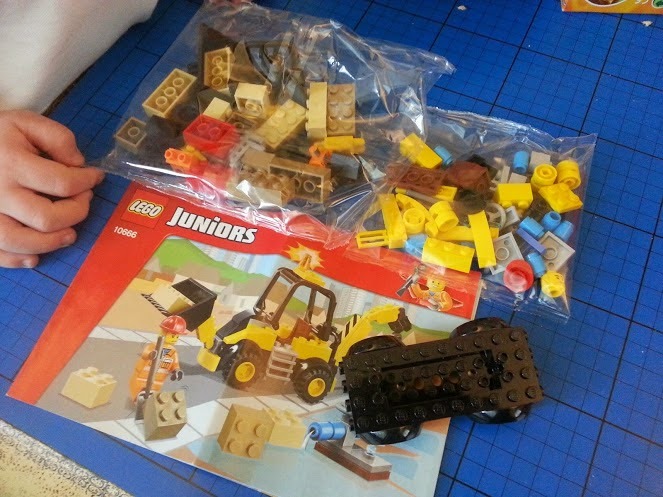 You will also find that the LEGO Juniors sets are sturdy and easy to play with - even if you're 4. 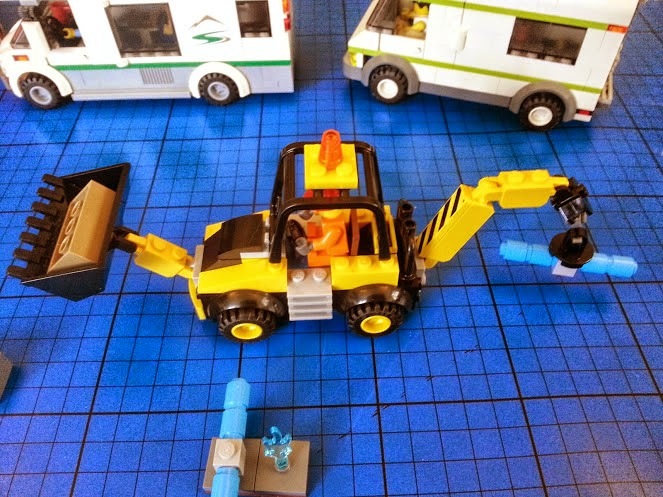 It's simpler LEGO for Junior builders aged around 4-7. 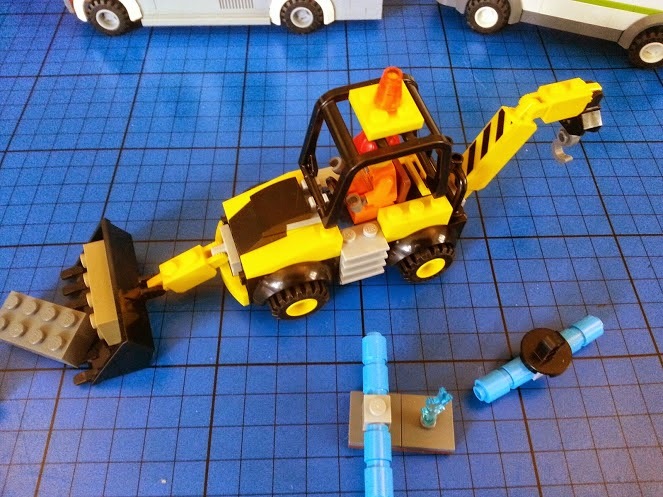 The LEGO Juniors Digger set 10666 is recommended for children aged 4-7, and our 4 year old built this by himself. There are 75 pieces and it has an RRP of £9.99, although is on offer at £6.99 at the time of typing at LEGO Online. 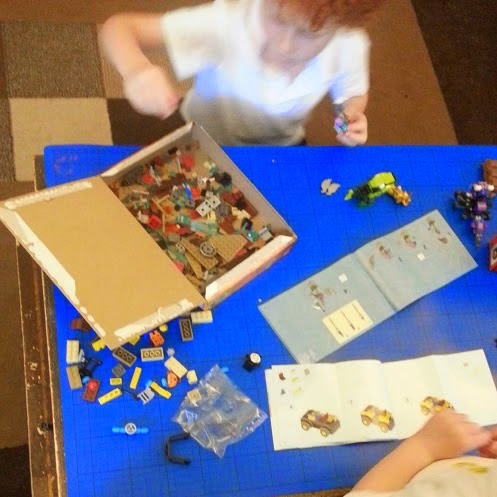 The photo above shows the differences between the two sets my boys are building. 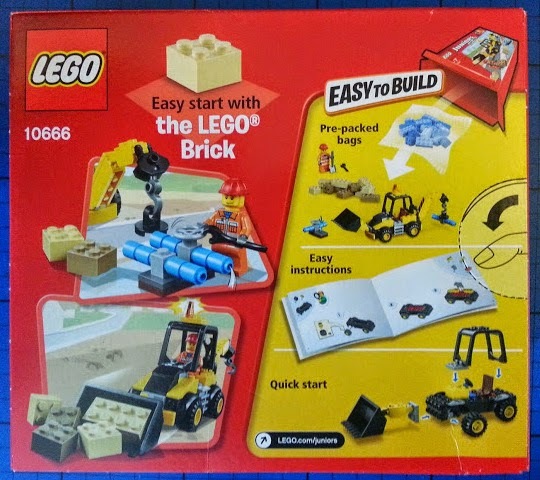 The clear pictures on the LEGO Juniors model are far larger, and the illustrations are more spread out. The colours are more distinct and there aren't lots of single and double stud pieces because they're much harder for young children to grasp and pull with enough finger strength. 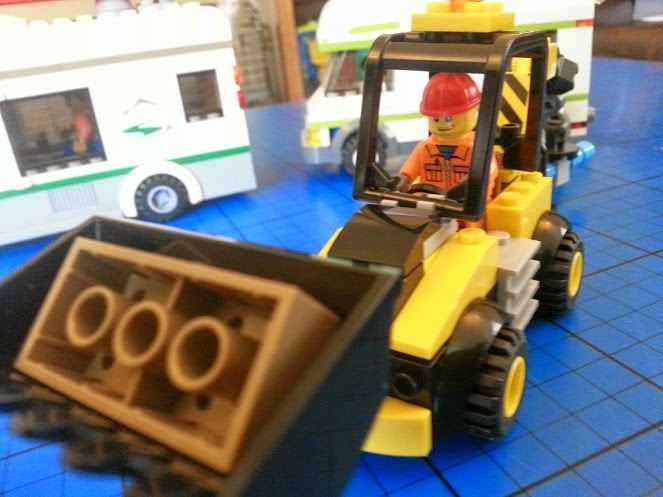 The Digger is a nice set because it is very poseable, and strong enough a model that my 4 year old can play with it and move his cargo around the table. This set is a nice little set, and ideal for a younger builder. I actually think it's a little expensive at £9.99, but on offer at £6.99 it's a bargain and makes a brilliant gift. It was easy for my 4 year old to make, and he's played with it loads, it's a definite win. I like the look of these but I do wonder about the longevity of them. Bud loves adding the wheels most so he wouldn't be too impressed to find them already on! I got this one as a last minute extra for Christmas when I saw it on special offer in town as he loves diggers so much. He loves it and I've been really impressed with the Juniors sets in general. We now have quite a few of them. Monkey has started to build them by himself and then modify them, which to me is what Lego is all about. Love this next stage of his construction journey. Love the look of it! Look great fun! I like the idea of these if your child is struggling making that transition from Duplo to LEGO.